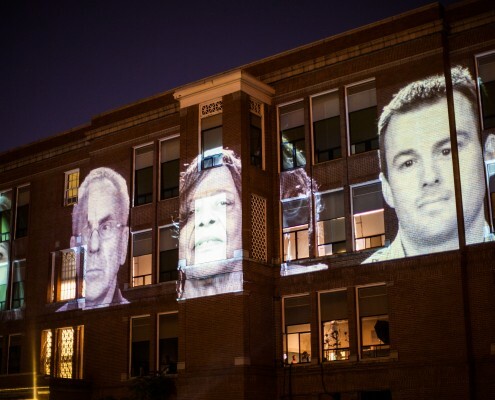 The People, an outdoor spectacle that combines live theater with large scale, real time video projection. The narrative, constructed from interviews with members of the local community who voice their thoughts about democracy, war, terrorism and justice as it relates to their personal histories, loosely recreates the story of Aeschylus’ Oresteia. 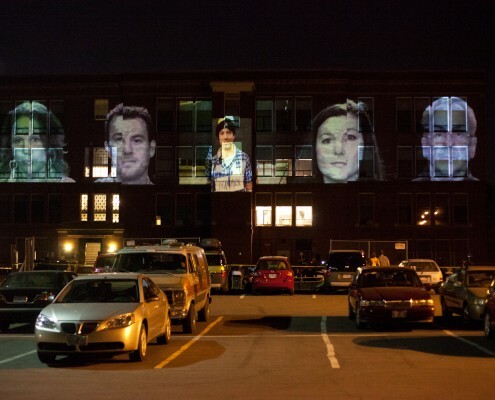 Live theatrical reenactments are intercut with earlier, taped interviews, projected via large scale video onto the side of a building where the live play and video is viewed by the audience at street level. Perceived as a kind of ‘living television,’ The People repurposes commonly used media strategies such as video clips, interviews and re-enactments, to explore the extraordinary forces reshaping contemporary government. It sculpts these developments into a performative action, that takes as its inspiration the foundational idea of community dialogue and the birth of democracy as theatrically embodied in the Oresteia. 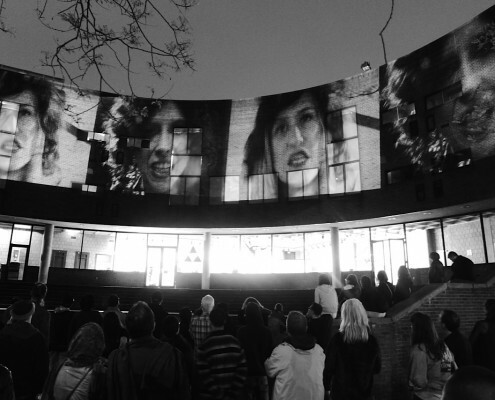 By inverting the established relationship between ‘mass-media’ and private exchange, it transforms the ‘town square’ into a public performance in which both performers and audience act out crucial roles in the construction of self-government.